A great photograph is a full expression of what one feels about what is being photographed in the deepest sense, and is, thereby, a true expression of what one feels about life in its entirety. And the expression of what one feels should be set forth in terms of simple devotion to the medium – a statement of the utmost clarity and perfection possible under the conditions of creation and production. 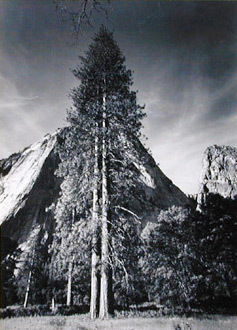 Adams’ devotion to landscape led him to a lifelong association with the Sierra Club. He was simultaneously training for a career as a concert pianist but by 1930, after meeting Paul Strand, decided to devote his full energy to photography. In 1932, with Willard Van Dyke, Edward Weston and Imogen Cunningham, he helped found Group f/64, the group that sought to promote the “straight” unmanipulated photograph as an art form. Through all his work, Adams helped set a standard of excellence for the medium. He met Alfred Stieglitz in New York in 1933 and was given a one-man show in 1936 at An American Place, Stieglitz’s premier gallery. His work was also shown at the Museum of Modern Art when Beaumont Newhall established the first department of photography there in 1940. Adams founded the department of photography at the San Francisco Art Institute in 1946 and was instrumental in creating the Friends of Photography in Carmel, California in 1966. The author of many books, including several on photographic technique, Adams formulated his unique and well known Zone System, a complex method of exposure and development- control. He always stressed and achieved a mastery of the technical aspects of photography in order to enhance the photographer’s concept of an image and visual interpretation.